Church Elders: How to Shepherd God's People Like Jesus is one of the newest volumes in 9Mark’s series “Building Healthy Churches.” Written by Jeramie Rinne, MDiv from Gordon-Conwell Theological Seminary, the book is filled with the insights of a seasoned senior pastor. The book lends itself to be read by elders, potential elders and churches considering the adoption of elders. Church Elders is an easy to read book. Filled with examples, Biblical instruction and practical insight Rinne covers all the bases. There is hardly a time when the book goes over the top in its description of Biblical texts or practical examples. This book is written for laymen and lay pastors and makes itself readily available to be understood and consumed by this audience. The book is written from a congregational and credobaptist view but this does not affect the communication any valuable principals. Although church and elders of the Presbyterian ilk will certainly find elements of disagreement, Church Elders provides an accessible and valuable introduction to the subject. Church Elders is split into eight brief chapters working through the qualifications and responsibilities of elders. Though nothing new is derived from the qualifications as they are found in Scripture, Rinne provides a practical exposition of them (19-29). Of particular important is Rinne’s emphasis that “teaching the Bible is central to the elder’s shepherding work” (24). In fact he devotes the entirety of chapter three to this principal element. In an effort to distance the Biblical view of eldership from the “board of trustees” (32) Rinne emphasizes that every elder is in fact a pastor in the church (32-37). This includes every elders being an expounder of God’s word and an able teacher. Though this may go against certain traditions, Rinne is correct that this simply follows the Biblical requirements for an elder. In the application of an elder’s responsibilities Rinne hits on multiple interesting elements. Elders should be paying attention to congregational singing (53) and must be watching for straying members (all of chapter four). This concept of “straying from the flock” (57) is a valuable insight provided by Rinne that should greatly change the way both elders and congregants view their church fellowship. People do not “fall through the cracks” (57) but purposefully remove themselves from the church in ways that elders can look for and combat (62-68). In chapter six, Rinne supports the concept of a plurality of elders. He goes so far as to plead with congregants and elders that any “mono-pastorate” is “biblically out of order” and deprives the church of “richer pastoral care” (95). Chapter seven encourages elders to strive in their modeling of Jesus Christ and chapter eight petitions elders to model Christ in their emphasis on prayer. 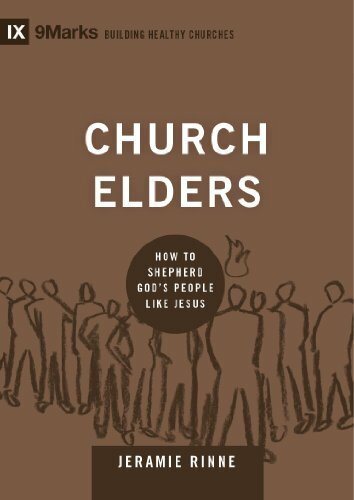 Church Elders is a great edition to the 9Marks book series. Because of its brevity and content there is no reason why this book should not be read. Elders and churches considering elders will benefit for the proliferation of this book. Even though it does not address all the questions about elders it acts as a wonderful introduction. Those seeking a strong or more specific argument about what elders should rule over will have to look elsewhere. Church Elders addresses some of these in general but not in the specific terms for every situation. Those of Presbyterian and Congregational traditions will surely differ on their perception of what elders preside over but in both cases the Biblical model of elders can be faithfully applied. Jermaie Rinne has provided such a book on the need and outworking of Biblical elders while providing valuable instruction.